Home / Oracle Cards / Goddesses & Gods Combined Offer! You will receive a best selling Gods & Titans Oracle Deck and the new Goddess & Sirens Oracle Deck at a special discount price! Keep both for yourself or give a set as a gift, but either way, you gain! “Goddesses & Sirens”: Strong, Powerful, Loving …and on your side! There was a time when Goddesses and Gods, the Feminine and Masculine Divine, were the two halves of a creative whole and were honoured deeply in that way. Yet, with the coming of new religions, the Feminine Divine became feared, disrespected and almost lost to the world. Again, She rises! Featuring beautiful yet practical spells and original invocations as well as a full explanation of each Goddess’ history and influence, this deck invites you to rediscover the oldest energy, that of the Feminine. – Allow the Goddesses’ great creativity, love, strength and joy to inspire you forward every day of your life! Features Goddesses you may know like Hekate, Isis and Aphrodite and some lesser known, but equally powerful like Andromanche, Qetesh, and Baba Yaga. The Feminine Divine lives in fullness again! Join Her! Set includes 38 cards with original illustrations and detailed 152 page guidebook, packaged in a hard-cover box set. 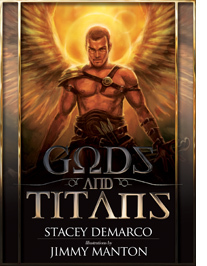 “Gods & Titans” Oracle Cards: Dedicated completely and only to the Masculine Divine! There was a time when Gods and Goddesses, the masculine and feminine Divine, co-existed equally and were honoured side by side. Yet with the passing of time this sacred union was lost. It’s now time to restore the balance! Featuring original tried and tested invocations and spells as well as a full explanation of each God’s attributes and influence, this deck invites you to come back to a time when Gods really were Gods! This set features Gods and Titans from many different cultures,countries and times showcasing well known favourites as well as the remembering of equally powerful, but little known deities. The masculine divine in all its forms and glory has returned! – Allow the Gods’ strength, action, compassion and protective love to flow through your life. – Discover the oracular power of these cards for every day or special readings. Set includes 36 cards and detailed guidebook, packaged in a hard-cover box set. NB: Stacey will sign and leave a special message within the guidebook of each set. This means the box will be opened. Should you not want this, do let us know by leaving a note in the comments box when ordering. Australian orders: Your cards will be sent via express mail only. This method is traceable and safe. Overseas Orders: We will confirm mailing costs at checkout dependent upon your country.